As the University held its 23rd, 24th and 25th Combined Convocation Ceremonies’ Press Conference, the Acting Vice-Chancellor, Professor Ololade Enikuomehin, has revealed that the importance of the media could not be over-emphasised, saying that as the Fourth Estate of the Realm, the media have become the veritable tool for strengthening civil rule because of the unique ability to mirror the society and a change agent in the democratisation process. The Acting Vice-Chancellor, who is also a Professor of Plant Pathology and Mycology, reiterated the essence of holding the press conference, noting that the University cannot afford to be left behind in courting the media to realise its objectives. Highlighting the various achievements of the University, especially in the area of grants, Professor Enikuomehin stated that the Cassava Adding Value for Africa Phase II (CAVA II); a Bill & Melinda Gates Foundation project, implemented by the University and the Natural Resources Institute (NRI), United Kingdom, had attracted over USD 10 million for five countries, namely: Nigeria, Ghana, Tanzania, Uganda and Malawi. Other research grants he mentioned were the Alexander Von Humboldt Foundation, National Research Centre on Mithum, Grinter Fellowship for Outstanding new Ph.D students, International Foundation for Science (IFS), and Developing Partnerships in Higher Education (DELPHE). A Fellow of the Nigerian Society for Plant Protection, Professor Enikuomehin, stated that the World Bank’s Africa Centre of Excellence (ACE) in Agriculture was an outstanding achievement for the University, adding that it was to promote regional specialisation among universities within areas that address regional development challenges as well as strengthen the capacities of these universities to deliver high quality training and applied research. Commenting on staff development and welfare, the Acting Vice-Chancellor said that staff promotions had been regular without compromising quality in the assessment processes, adding that the University had a total of 570 academic and 1,472 non-teaching staff. Professor Enikuomehin, who stressed that FUNAAB students were well behaved, noted that there were 29 National Universities Commission-assessed programmes in the University and a student population of 17,312, made up of 15,847 undergraduates as well as 1,471 postgraduate students. Professor Enikuomehin, stated that there were 1,881 graduands in the 2013/2014 Academic Session, also noted that in 2014/2015 and 2015/2016 sessions, there were 2,731 and 3,065 graduands, respectively. He added that the University produced 71, 75 and 57 First Class graduates in the 2013/2014, 2014/2015 and 2015/2016, respectively. On physical and infrastructural development, the Acting Vice-Chancellor stated that the Federal Government’s revitalisation fund, otherwise known as NEEDS Assessment projects commenced in 2015, adding that they were at various stages of completion. The Acting Vice-Chancellor recalled the donation of N15 million towards the construction of a Police Post in one of the adjoining communities, noting that other intervention efforts were being made, to strengthen the security of lives and properties in those communities. According to him, “Over the years, FUNAAB has been able to develop and sustain virile community relations programme that have fostered sound Town and Gown relationship with its host communities, parents, government agencies, non-governmental organisations and the media”. 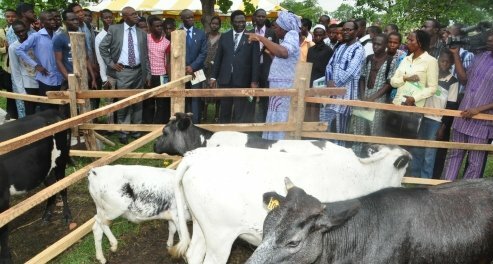 Commenting on the University’s future plans, Professor Enikuomehin stated that the University would continue to partner and collaborate with the government as well as the private sectors within and outside the country, adding that the University was recently placed under the supervision of the Federal Ministry of Agriculture and Rural Development, as the supervising ministry. The Acting Vice-Chancellor, however, admonished the media to strive to always be objective, unbiased and constructive in the best interest of the society, adding that they should not be seen as serving vested parties under any circumstances. He further stated that the media should remain an umpire that keeps the system going and running smoothly. Earlier, the Chairman, Ceremonials Committee, Professor Biodun Badmus, noted that the men and women of the press were always welcome to the University. Present at the event were several journalists from the print, electronic and new media from within and outside Ogun State as well as Principal Officers, Deans, Directors and Heads of Departments and Units in the University.